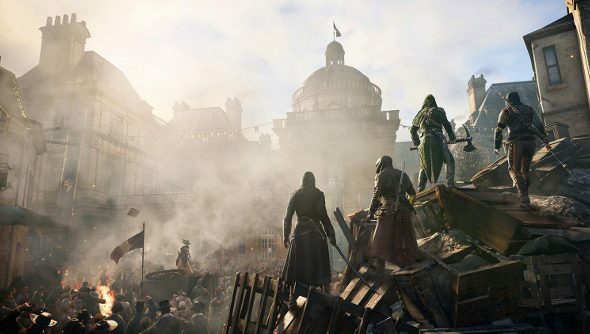 Ubisoft’s pretty chuffed with the tech behind Assassin’s Creed Unity. And well they might, because at a glance, it does seem fairly impressive – at least in terms of creating a lively, detailed city. Creative director Alex Amancio lends his voice to a video breaking down the improvements brought about by Ubisoft Montreal and the redesigned game engine, including buildings that are no longer just facades and more fluid movement when travelling and in a fight. Take a gander below. Paris does look rather lovely, even when it’s dirty and filled with angry revolutionaries. I do wonder how far the studio has gone in making the buildings part of the world. Amancio says they aren’t facades, showing off interiors, but I can’t see them doing that for every hovel in all of the city. Are you lovely folk sold yet, or have you managed to cast “shield against Ubisoft hype”?